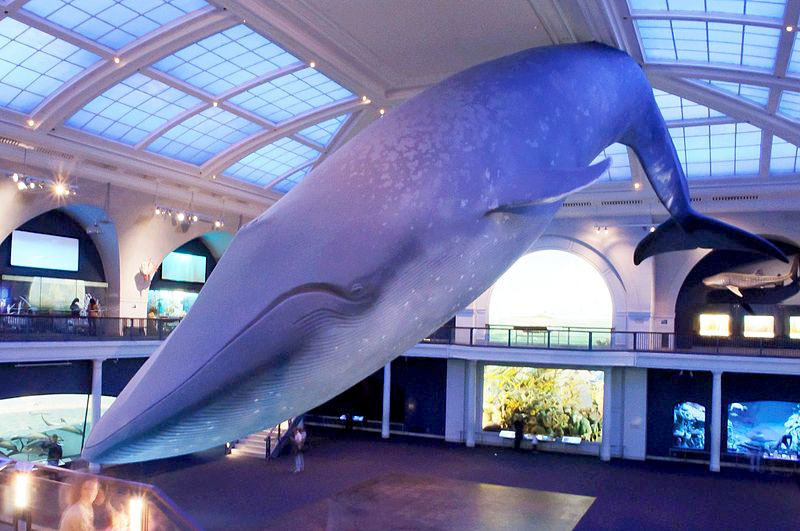 Model of a Blue Whale in the Irma and Paul Milstein Family Hall of Ocean Life, American Museum of Natural History, New York. Photo credit: “Skinny Lawyer.” Creative Commons licence. …click to enlarge. The deaths of nine blue whales in thick ice near the shores of Newfoundland this spring shook researchers who study the creatures. Whales become trapped and perish every year in ice, in the far southern and far northern oceans. Most die unseen and unremarked upon by humans. Their bodies become nutritious troves for other creatures, and life goes on — or if they wash up where people live, they become a disposal problem. Some, notably narwhales in the Canadian Arctic, are stricken near enough to settlements to be hunted and harvested by Inuit people, and these days such hunts are broadcast by media outlets to a world transfixed by the grisly spectacle. The death of the blues, though, came as a shock, said biologist Andrew Trites of the University of British Columbia. Scientists are pondering the repercussions of losing nine members of an endangered North Atlantic population of a mere 250 adults – fewer whales in an entire vast ocean than there are people in the smallest of villages. Usually, he says, whales that die in the ice are ice specialists like belugas, narwhales or bowheads. “The bowhead whale is an ice specialist; their backs are built to break through thin ice. Blue whales are not an ice species. For the most part, they tend to feed far off shore, where there is higher ocean productivity, and more food for them. In fact, not a lot is clear about the great blue whale. Fast and powerful compared to slower prey like the haplessly-named Right Whale, blues escaped the whaling industry until the late 1800s, when steam and torpedo technology caught up to them. Over the following century, until whaling was legally banned, they were nearly hunted to extinction. It was public opinion that eventually put an end to most of the slaughter, advocacy typified by Arthur C. Clarke who wrote in 1962, “We do not know the true nature of the entity we are destroying.” It took another 24 years before the International Whaling Commission banned commercial whaling, in 1986. Blue whales are thought to live some 80 years — but nobody really knows, because too few survived whaling. They are not social like other whales; rather than moving in packs they travel in twos or threes, feeding by taking vast quantities of water into their mouths then filtering out and swallowing krill. Their Latin name, musculus, was chosen by Carl Linnaeus in 1758; he may have been playing with the double entendre in a word than can mean both muscle and mouse, an amusing name for one of the largest animals thought ever to have roamed earth. There is nothing mouse-like about the few blue whales on public display in select world museums. The skeleton of one of them, a cousin of the blue whales that died off Newfoundland this spring, is suspended from the ceiling of the Beaty Biodiversity Museum at the University of British Columbia on Canada’s West Coast. The creature hovers over and dominates the massive exhibit hall below. Her mouth is agape and she seems poised in mid lunge, her skeleton seemingly so fluid that onlookers below might imagine her flesh restored, her torpedo-shaped body darting through the Atlantic waters. That whale was found dead in 1987 on the shores of Prince Edward Island. The museum jumped at the chance to ship it west, where it was installed in 2010 as the museum’s star exhibit. The whale in Prof. Taylor’s care was found dead of a crushed skull, likely from the same cause that kills countless whales in the post-whaling days: a run-in with a ship. The deaths of the whales off Newfoundland are not so simply explained. Why were they so close to shore in the ice pack? Why didn’t they flee to warmer waters? Why were they together? the Royal Ontario Museum dissect a blue Whale.